Just finished these up. Militia in hunting shirts with round hats as they were called at the time. These are from Brigade games miniatures. I had heard good things about them. Nicely cast, tall and slim .They fit in well with my figures from Knuckleduster miniatures. But a little more expensive. Uniform wise they would work for almost any campaign. So they are ultra useful. I really like the look of the militia officers in their fancy uniforms. Very militia like. Flags are based on actual New York militia flags. Could have used a single flag, but I like the look of two better. Really nice looking! All of your work is really tempting to start a War of 1812 project (like I need another!) though I am a bit anxious about painting Napoleonics. Thanks for sharing. They do look good. Take a look at the Tenn militia uniform worn at Horsebend historical site by park rangers. If you go to the celebration in March, you can see them firing a cannon as well as drill. 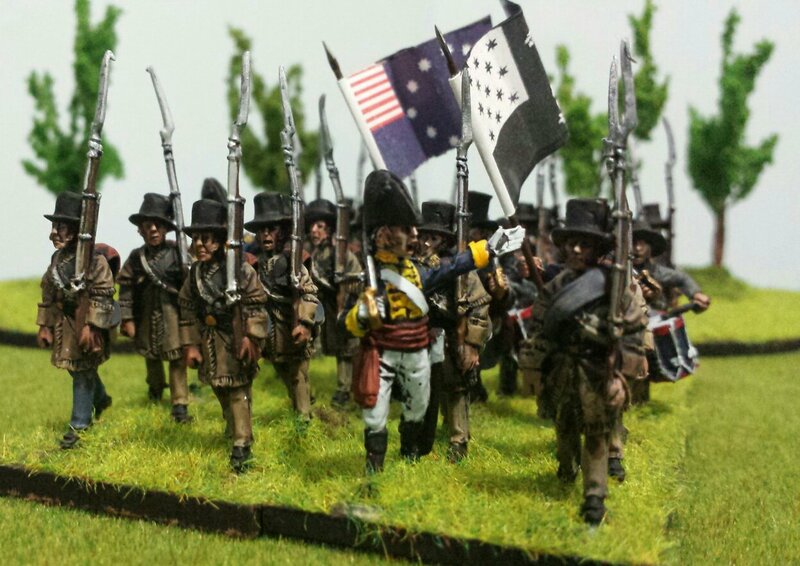 I am starting 1812 in 15mm. Have most of the figures and been reading. Have a couple of scenarios worked out and as soon as Call to Arms convention is over will start painting.